Let’s look at two words that are often used interchangeably but mean different things: proprioception and kinesthesia. According to the American Heritage Science Dictionary, proprioception is “The unconscious perception of movement and spatial orientation arising from stimuli within the body.” In other words, it’s the awareness of body position and location. Kinesthesia is the “Sense perception of movement, the muscular sense,” meaning an awareness of how movement is performed. Proprioception is the result of sensory input throughout the body (skin, fascia, muscle, joint receptors), which then sends feedback to the spinal cord and brain. Kinesthesia, however, is more behavioral in origin and your body is more actively involved in assessing movement patterns and making adjustments. In yoga and other movement disciplines, we need both our proprioceptive sense and kinesthetic abilities to execute tasks. In addition, the brain exhibits neuroplasticity, meaning that changes in nerves and synapses can occur, new movement skills can be acquired at any time, and there is potential for new neural connections throughout life, regardless of age. Unconscious Incompetence: The student does not know or understand how to do something, and therefore does not know their own incompetence. Conscious Incompetence: The student does not understand how to do something, but sees their own deficits and is eager to learn. Conscious Competence: Student understands how to do something but is refining the movement and skills needed. Unconscious competence: Student is able to execute the skill with minimal effort and ease. Let’s apply this to a movement skill that I am still refining: handstands. When I first tried a handstand, I was convinced that I could not do one (having not done them in my youth), and had no idea where to start, thus the unconscious incompetence phase. I later started to build the strength needed in the shoulders, although my kick attempts were clumsy (conscious incompetence). A few years later, I was able to kick up to the wall, albeit not always gracefully, and able to refine my kinesthetic mastery of the movement mechanics, thus conscious competence. I think I’m still somewhere in the conscious competence phase in regards to handstanding, since it’s not yet second nature, but we’ve all seen people pike and float into handstand with no problem, thus unconscious competence. This same matrix can be applied to musical training, whether with a musical technique or concept or a selection of music. Let’s tie this all back to yoga asanas – after a certain point, many of the traditional yoga asanas (vinyasa, downward dog, tadasana, warrior poses, etc.) become very familiar, thus unconscious competence. We may have a remembered rote sense of what poses usually “feel” like, and thus replicate a similar felt experience each time. We may no longer think about the way we execute the pose, and may be doing the poses on autopilot, with little felt sense of proprioception or kinesthesia. The same is true with musicians with warmups- I am absolutely guilty of doing the same warmup every day, and just sort of going through the motions. How can we challenge our self learning and assessments with our instruments and habits, even after playing an instrument for 15, 20, 25 years? The solution? Make poses and movement new again and think out of the box. For movement, my favorite way to do this is with pilates and Yoga Tune Up®, as they have both been challenging for the brain and body in bilateral movements, new pose orientations, and joint explorations. For music, I invite myself to warmup by improvising- if I'm working on an excerpt, I have to remind myself to approach it as if it were new, whether that be through new fingerings and bowings, playing the accompaniment parts in the orchestra, playing along with recordings, or simply challenging myself to learn new repertoire, etudes, and concepts. 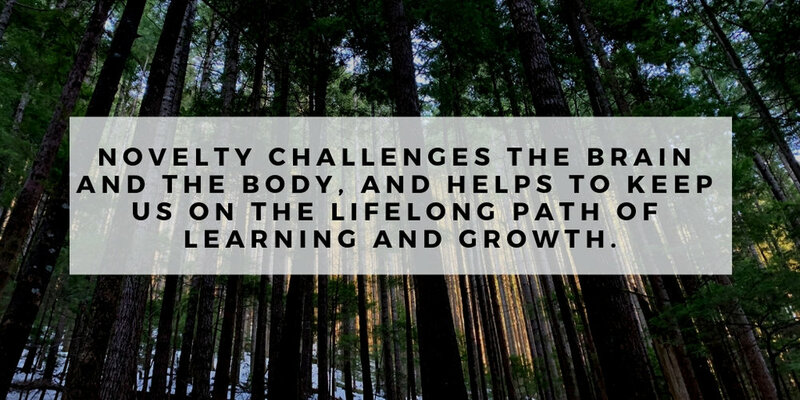 Novelty challenges the brain and the body, and helps to keep us on the lifelong path of learning and growth.